"There are a few pages missing..."
What? How could he tell that? I moved over to him, and looked over his shoulder and looked at the area he was rubbing his finger along. "Look! They're ever so slight, but you can see the edges of a few pages that have been torn out..."
Looking more closely, I could indeed see the torn edges wedged deep into the spine of the book, almost not even there... As further proof, AMPHIS closed the book, and looked at it from the side. "See? The pages don't seem perfectly straight after those torn pages. There's a slight gap... There must be at least... Seven or eight pages missing... That would explain why the book seemed to end so suddenly! The book was completed, or at least contained more information, but was never fully filled, hence the blank pages at the back. Someone must have found this book and torn the last written pages from it. Either that or... The person who wrote this disagreed with their own work..."
Maybe whoever had wrote it found out what they had written was wrong... Or maybe... A million other maybes could be the real answer, but we weren't going to find out the truth by just guessing... After looking at the book for some time, UOPETA and THEROS emerged from their rooms, and I followed them out to the hatch. Before leaving however, I stopped and turned to AMPHIS to tell him to inform COLUS about what he had found. Choosing a path before heading down, I then carefully edged further towards the lava flow, hoping to find some useful, and maybe precious ores and minerals further down. As I got closer to the lava, the temperature increased, which was actually rather inviting, what with the slight drop in temperature due to being deep underground. Navigating past it cautiously, I jumped over a small stone step, and down onto the lowest part of the chamber. There was quite a bit of iron down here, but there was still much to explore, and I'd rather secure the rest of the area before continuing. 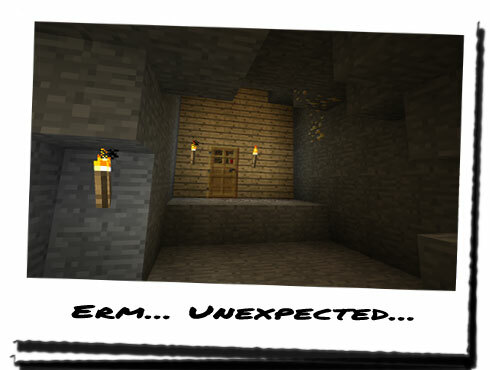 It was unlikely, but I didn't want to risk being attacked by a Creeper I hadn't found due to lack of securing the area! 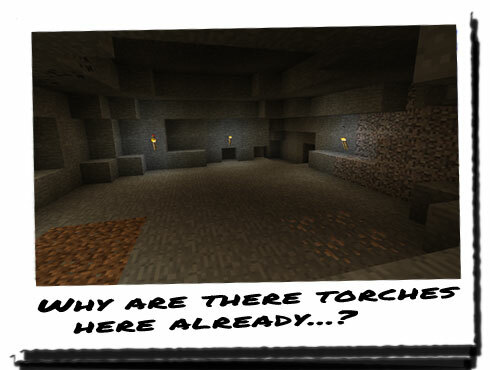 I continued through the chamber, lighting torches, lying them on the ground and on other convenient places. There was lots of iron down here! Tons of it! OROTHO and COLUS would be very happy with this haul! I'd need to get UOPETA and THEROS to help me extract it all though. But first, I decided to finish of exploring the rest of the chamber. 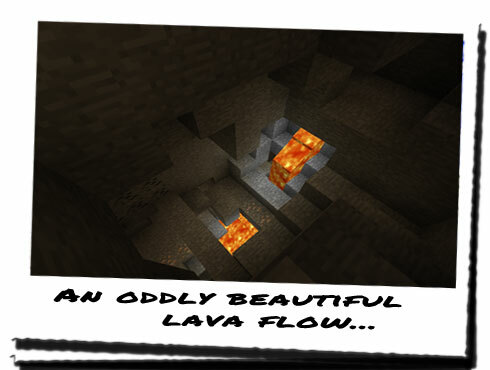 From around a bend, I could see a small amount of light, and was a little surprised at the presence of even more lava! How deep was I? Rounding the corner, the light source came into view, and I stopped, very confused... I called out to UOPETA and THEROS, but I heard no reply... Odd... How was that possible...? Curiously, I shouted 'Hello' and waited a few moments for a response, but there was still nothing... Incredibly confused, I stepped forward into the main chamber that had expanded upwards and outwards, leaving an odd hollowed out area with a high ceiling. This wasn't what had confused me though; against a few of the walls, still burning torches stood, casting light into the centre of the chamber... Who was here...? Who put these here?